Details have emerged after the tragic death of 25-year-old Cynthia Nwafi, who was killed by her fiancé, Friday Njoku, 30, who then committed suicide after committing the crime. The incident happened on Friday, September 1, 2017, in Aguogboriga axis of Abakaliki, the Ebonyi State capital. In a report by Sunday Sun, it has been revealed that the death might not be unrelated to an event that happened in the past in which the lady in question allegedly swindled three suitors. Sunday Sun learnt from a member of the local vigilance group that helped to convey Cynthia to the hospital before she died that she had been allegedly warned by some neighbours about her alleged inordinate relationship with men. They told a story of how she allegedly dumped her first fiancé who paid for her shop and bought some electronic devices. “That girl had already disappointed the first man who wanted to marry her. It was that first man that paid for the container (shop) where she was sewing clothes and bought her a 20inch foam mattress, electronics and other home appliances. “She was about dumping this one that killed her (Njoku) for a man who works in the National Obstetrics Fistula Centre, Federal Teaching Hospital, Abakaliki. In fact, I learnt that Njoku had warned that one to leave his girlfriend alone, saying that he had already taken palm wine to her family,” the vigilante told Sunday Sun. “The first man, in anger, told her that she would dump another man in the same manner. She actually dumped that first man for this man that killed her. That man working in the hospital is very lucky. He could have been the one that Friday would have killed,” he narrated. “The two of them quarrelled earlier in the day. Njoku swore to her that nobody else would marry her apart from himself. I learnt that the girl replied him that he was not serious. We learnt that the guy had met with her family, to declare his interest. “On Wednesday, we learnt that Njoku and the hospital guy exchanged words. Njoku reportedly told him to steer clear off his fiancé. Then, on Thursday night, the guy killed both the girl and himself. We did further investigation and learnt that her landlord had warned her about Njoku, who he felt had a weird character,” the vigilante said. According to a close source, the two lovebirds had been in a relationship for quite a time. Njoku was said to have taken wine to the parents and relatives of his girlfriend to indicate his intention to marry her and was accepted by Cynthia’s family. He was making arrangements to walk her down the aisle before the tragedy happened. Sunday Sun gathered that Njoku, a day before killing his lover had accosted her parents and accused Cynthia of infidelity. The Cynthia’s family denied the allegation that their daughter was unfaithful to her lover. Although they admitted that the late Njoku had made known his intention to marry Cynthia, their marriage had not been sealed, hence, he had no moral justification to lay claims to her. Narrating what transpired, Offia said: “Around 1 O’Clock in the night, I got information that one Friday Njoku from Ebonyi Local Government Area stabbed my sister to death. I went to the state police headquarters, Abakaliki and reported the matter. I learnt that the assailant killed himself after stabbing my sister to death. I also went to the mortuary and saw his corpse. Friday Njoku was my sister’s fiancé. He had not actually concluded the marriage rites but he had brought drinks for us and the family accepted him, the girl also accepted him. “The girl was living in her house and Friday was also living in his house. They had not been joined together as the tradition demands but we were all aware that Friday was Cynthia’s fiancé though he had not paid her bride price. Friday was a motorcycle operator; my sister a fashion designer. “My sister and Friday were in good terms. Even, Friday came to my house a day before he killed my sister. How could Friday say my sister was unfaithful when they were not living together, they were not legally married?” Meshark added. 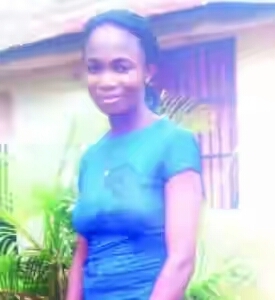 Recall that Njoku after stabbing Cynthia fatally, subsequently committed suicide in his house. He was said to have drank a poisonous substance. On the fateful day, he stormed the residence of his lover located on No. 5 Amachi Street, along Odunukwe Street and stabbed her all over the body with a knife before bolting away. Some of the neighbours who spoke with Sunday Sun on condition of anonymity said Cynthia was cooking late in the night while also handling some other domestic chores when her lover arrived at her residence. The seamstress who had no premonition of the impending doom, opened the door to receive her boyfriend. She was said to have returned to the kitchen when Njoku came from behind and stabbed her on her chest and other parts of her body severally and ran away leaving her in the pool of her blood. One of Cynthia’s neighbours, a lady, who mustered courage to rush to her aid, Sunday Sun learnt, was also attacked by the assailant. She was said to have hastily ran back to her apartment with a knife cut on her hand. Vigilance officers (names withheld) in the area told Sunday Sun that the victim had raised the alarm, calling on her neighbours to come to her rescue. But given the ungodly hour of the incident, coupled with the light rain showers, the neighbours who were apparently eavesdropping on the rowdy scene from their apartments did nothing to help her. Apparently with the last drop of energy left in her, Cynthia stood up from the pool of her blood and staggered to the gate of one of her neighbour, banging and calling out for help. The security men said it was at that point that their team arrived at the scene and took her to the Federal Teaching Hospital, Abakaliki. He said that the assailant absconded with Cynthia’s mobile phones. “We went to her shop and copied her phone number. When we put a call to it, her attacker picked and said that it was a wrong number. From the way he was breathing, we knew he was running. “When we pressed further, he admitted to holding her phone but said that she was not around and cut the phone call,” he said. Meanwhile, the state’s Police Public Relations Officer (PPRO), Loveth Odah, an Assistant Superintendent of Police, confirmed the death of the two lovebirds. She said that investigation was still ongoing as at the time of filing this report.